It’s God’s job to workout it out for good. –Do you want relief from devastating stress, or debilitating anxiety, or demoralizing worry? Do you want all the paralyzing fears of life to end today? Here’s the solution… let God do His job. It’s God’s job to make everything work for good, not ours. It doesn’t matter how hard we try we can’t make all things work together for good. It doesn’t matter how much we worry about the outcome of situations, it ain’t going change a thing. That’s Jesus point in Mat 6:27 where He said, “which of you by worrying can add one cubit to his stature?” So in a crisis let’s remember that’s it’s God’s job to work together all things for good, not ours. Conformity to the image of His son – Above everything else in this life, God wants us to be like His son. Paul constantly urged his listeners to be like Christ, to conform to the image of the Son (cf. 1 Cor 11:1; Eph 5:1-2; Php 2:4-5). Our glorification – In the context of this verse it seems that the good is our glorification in heaven. So we would say that God is working all things for good so we can go to heaven (cf. Col 3:4; 1 Pet 4:13-14). With a proper frame of mind about what God’s good is, then we can lay down the worry and let God conform us into the image of His son while He works out all things for the good of our glorification with Him in heaven. Our Job is to Love God. – If it’s God’s job to make all things work together for good then our just is just simple love Him. That’s it. Plain and simple is it not? Love God and He’ll work to see that all things in your lives will work together for the good of conforming you to the image of His son and the glorification in heaven. The test is, can we love God enough, that we trust Him completely with our lives most terrible moments? Can we trust Him with the crisis’s that come into our lives? Where else shall we go? God has the words of life (cf. Jhn 6:68). The God who created and sustained the universe, who has proven Himself to be a trust worthy friend stands by you ready and willing to work all things for good in your life. All you have to do is trust Him. All Things Really Means All Things. – Not just some things but all things. Not just the hard things but the easy things. All things really means all things. There’s an assurance in those words that there is no limit to what God can work with and work out. Let’s face it bad things happen to us. But God remains God and He is Lord over all the bad things that happen in this life. He is fully capable of using them in ways that will shine forth His glory and lift us to the heights of being conformed to the imagine of His son. What about the crisis that you’re going through right now? God can use it for good. It’s bad, and the pain you feel is real. But, God is Lord over all and He will use this for good. We are a part of God’s plan. – God has a plan and we are a part of that plan. Since we are a part of God’s plan then the crisis that is enveloping your life will be used by God as part of His purposeful plan for humanity. Are you wondering how that can be? Then consider the story of Joseph, or Stephen, or Paul. God used the crisis in the life of Joseph so that His plan for the Israelites would be fulfilled. In the case of Stephen’s death God used it as part of His plan to spread the gospel throughout the Roman world. 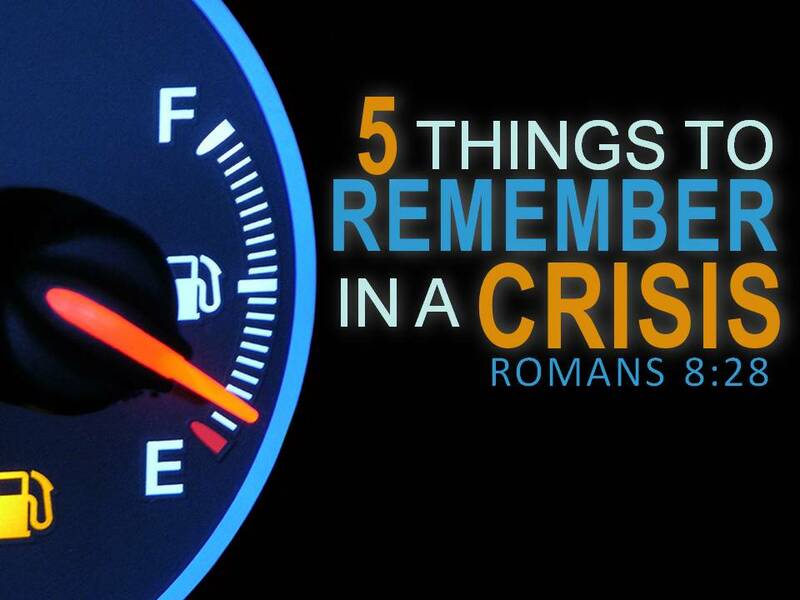 In the case of Paul’s crisis God used it to keep Paul humble so he would continue to establish churches. Just like God used the crisis’s of those in the Bible He will use you and your crisis to bring about His purposeful plan. Read Your Bible – Don’t just read your Bible to read it. Read the stories of God’s people who walked by faith and not by sight. Read about Joseph (Gen 37:12-36; 39:1-45:28) and learn from him how God worked out all things for good in his life. Or read about Stephen and how his death brought about the good of Christians being scattered so that the church could grow (Act 6:1-8:4; 11:19-21). Read about Paul and his thorn in the flesh and how God used it for good (2 Cor 12:7-10). The goal in reading these stories is to increase our faith to “know” the promise of Romans 8:28 is true (cf. Rom 10:17). Share Your Story – I know I refer to Mrk 5:19 often but it’s a passage that appeals to us as Christians to be people who share our story. That’s what Jesus wanted the Gadarene to do when He said “go home [his] friends and tell them what great things the Lord has done for you, and how He has had compassion on you.” When we share our story of how God has worked out all things for good in our lives, it will strengthen our faith through repetition. Sharing our story will give others hope and encouragement to press on in the faith. By sharing our stories with each other, we have unity because we come see that we’re all in this boat together. What have we learned today? God will see me through my crisis and He will use me and my circumstances as part of His great purposeful plan. May God bless you as you seek to love Him. I would love to hear your story about how God brought you through a crisis. Would you mind sharing it with me? You can email me at clay@claygentry.com.